Durham Attack Girls 13U Black Nightmares Win GOLD!!! 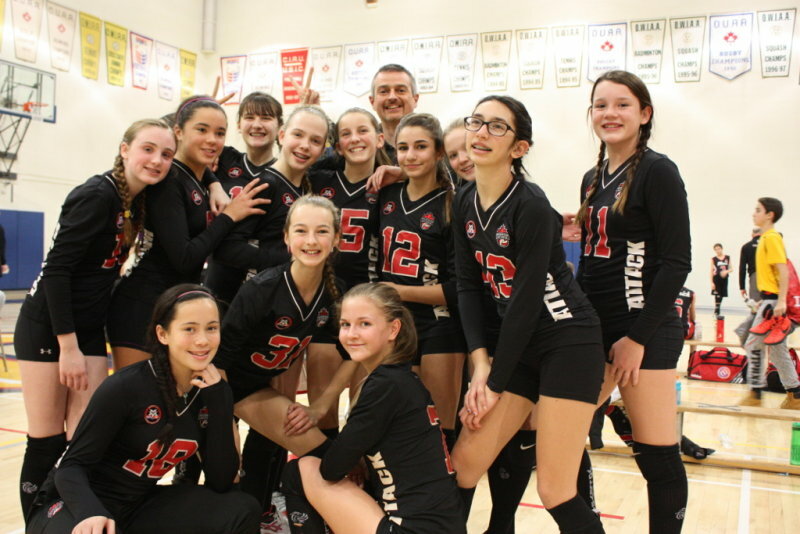 The DA Girls 13U Black Nightmares travelled east to Kingston for a 13U tournament on February 6th at Queen’s University. The day was strangely uneventful, with no fire alarms or other delays, and the girls excelled in the absence of distraction (even the 14U BOYS tournament being played on the next court posed no distraction for these determined young athletes). The competition brought the Nightmares up against 3 Ottawa teams over the course of the day, including our first two matches. First, in straight sets, the girls defeated Ottawa Fusion (25-11, 25-22), followed by a win over Ottawa Maverick Sidewinders (25-11, 25-19). With a break for lunch and a first crossover round bye, the girls had some time to refuel, rest and enjoy some corridor team fun. With an uncontested crossover victory over Kingston Pegasus (25-10, 25-13), the Black Nightmares faced their sister team in the semi-finals. The DA Red Flare proved to be our toughest competition of the day and after falling 18-25 in the first set, the Nightmares came back to win the next two (25-15, 15-10) securing their spot in the finals. The Nightmares brought their A-Game to the finals with solid play and outstanding teamwork, overpowering Ottawa Maverick Rattlers 25-14, 25-14 to bring home the GOLD, or so one would think. Unfortunately, the tournament convenor broke the news that the Girls 13U medals were not delivered and so the Nightmares were presented with the Boys 14U medals for pictures, and then reluctantly, had to give them back. Nonetheless, the lack of bling was entirely unnoticeable – the girls’ sparkling smiles made up for it!